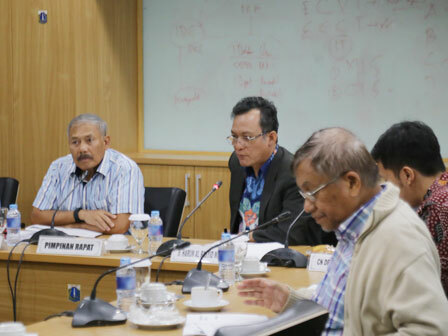 City Council's Special Committee (Pansus) for Muara Angke Port Arrangement invites Bandung Institute of Technology (ITB) academics to deepen Muara Angke Port arrangement plant in North Jakarta.
" It has land subsidence and tidal flood problems. Master plan is needed to develop this area"
ITB Civil Engineer Teacher, Harun said Muara Angke has many potentials. But it needs to be improved first. "It has land subsidence and tidal flood problems. Master plan is needed to develop this area," he conveyed, City Council Building, Wednesday (12/20). Based on Muara Angke georaphical location, it is similar to Seribu Islands which needs arrangement to open a great potential in Jakarta's tourism sector. "Thus a competent master plan is needed," he expressed. He also reminds to consider about economy aspect, especially fishermen life in arranging the port. "It means, besides development, traditional fishermen must be also empowered," he added.